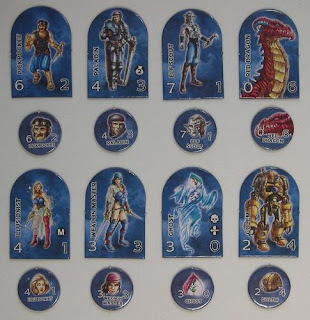 The first expansion of Dungeon Twister, called "Paladins & Dragons", adds a lot of new and exciting elements to the basic game. First of all each player gets 8 new characters with some already known, but with lots of new abilities. For example the Red Dragon, which can't move but spits deadly fire instead. Also exciting is the Illusionist, who can use magic and beside that creates the illusion of traps which block opponents, or the Ghost who can move through obstacles and walls, but has no combat value at all. Of course new objects are available as well, so you can protect your characters against the fire spit by the Red Dragon with a Fire Shield, or you can use the Dragon Slayer to kill the Red Dragon and earn two victory points for that. Last but not least 8 new dungeon tiles with partly new terrain like Fountains of Youth or Cliffs come with the package. As I already wrote in the review of the basic game (see link below) I really like Dungeon Twister - and the expansion "Paladins & Dragons"even strenghtens this opinion, by giving you a lot more choices concerning characters, objects and rooms - and therefor of course enriches gameplay in general. You can play just with the new characters and objects, mix it up or let each player choose secretly. In principal you use the same rules as in the basic box - and as again there are no dice necessary, there is no dependance on luck and you have to think hard about your moves. And leading your characters through the dungeon, trying to defeat your opponent, is just amazing fun. I'm already looking forward to the next expansion, and as this game is definitely one of my most favorite ones, I can just recommend to get your copy soon!! 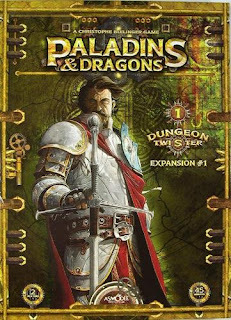 Paladins & Dragons is the first Dungeon Twister expansion. 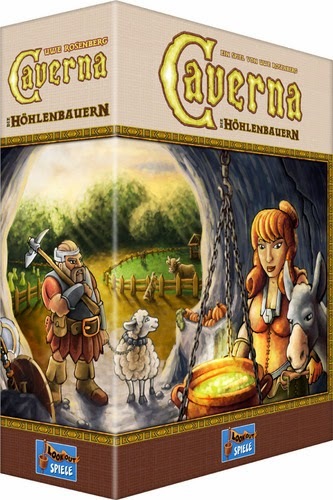 It features 8 new characters and 6 objects (including 5 new ones), as well as 8 new rooms with new terrain elements.You can mix all those elements with the Basic Set or play this expansion as a Stand Alone (you will only need the cards and the starting lines from the Basic Set).